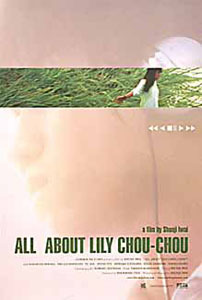 Yu Aoi Film Discussion – RIRI SHUSHU no Subete – All About Lily Chou Chou | personal.amy-wong.com - A Blog by Amy Wong. 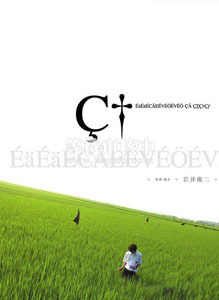 This is the first film I saw with Yu Aoi, without knowing who Yu Aoi was~~ I didn’t even know who Shunji Iwai was. I only decided to watch this because I liked the poster. Yes, I can be shallow like that because I didn’t even bother to read the synopsis… which I have found to be, most of the times, better than knowing what the film is about. 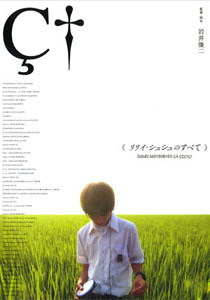 This 2001 film directed and written by Shunji Iwai, stars Hayato Ichihara (Yuichi) and Shugo Oshinari (Hoshino), as two childhood friends that go through changes between their time in Junior High, and High School. You can watch the film in 17 parts on YouTube. 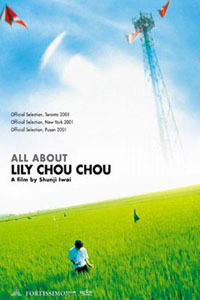 The film begins with a series of encrypted messages and the sound of keystrokes, as Japanese characters begin appearing, talking about Lily Chou Chou. Probably a very common notion, there are several people discussing events regarding Lily, her music and the Ether on a community forum. I was enthralled by the use of simple typographic elements, and music. 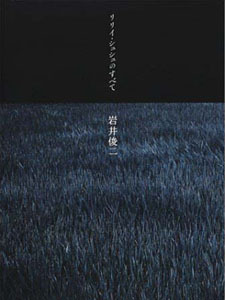 As the characters’ Internet persona interact, we see a young boy in an amazingly beautiful green rice field… simple, but hunting. He’s listening music with a portable cd player, and just stands there. However, I do appreciate the film for what it is… it makes you feel something, there’s always a knot inside… It’s hard to describe. The first time I saw it, I was actually more drawn towards Yu Aoi’s character, Shiori Tsuda, even though I should have been more disgusted towards what they did to Yoko Kuno (Ayumi Ito)… maybe it is because Tsuda ends up killing herself. I think the film is almost like really dark beautiful poetry… it’s beautiful to watch, but it always leaves you with a feeling of impending doom. Le sigh… can you feel that I just finished watching? ANYWAY! Onto Yu Aoi. I swear, I did NOT know who she was. *scout’s honor* – She plays Shiori Tsuda, one of the many classmates involved. Apparently she had been, er… doing ‘favors’ for men who could pay (I’m not entirely sure actually), and Hoshino had a tape, which he uses to extortionate her… so basically, Hoshino becomes her pimp. He calls, and Tsuda has to be where he tells her when he tells her. 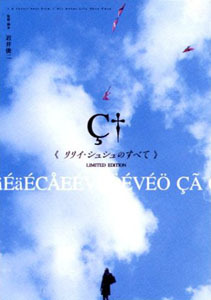 Like I said before, Shunji Iwai + Yu Aoi = genius. Favorite Scene: The scene of Tsuda and Yuichi at the restaurant, after Tsuda has stolen her client’s money. I think Iwaî is a genius and this one stands as a favorite. Over the years it has reached cult status really. Haunting story, haunting soundtrack and the contrast between the visuals (extremely light and poetic) and the tough themes (death, frustration, suicide, bullying…) is stunning. I love many things about Iwai as a filmmaker, one of them is how beautiful he can make everything… and well, the soundtrack~~ I love Salyu’s voice, but i think this soundtrack is one of the bests! The thing about this film, it’s soooo tough to watch… like witness an accident, and you want to look away. 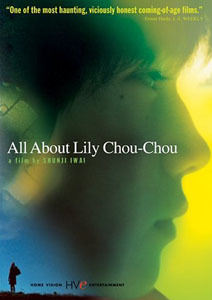 Iwai crafted a film so beautiful, you go back to it… sighs. I also posted on IMDB. Okay, I think that I may have picked up on something from watching this film several times. I may be digging too deep with this analysis, but hear me out. Take the three main characters in the film that are being bullied by Hoshino….=Kuno, Tsuda, and Yuichi. I’ve noticed that each time one of these characters ‘redeem themselves’, a ray of light is shinning. Take Kuno for instance. After being raped, she could have taken the easy way out and dropped out of school. Instead, she decides that she will not be bullied anymore and so stands up to them by shaving her head. In a way, she is sort of redeeming herself for her past actions of allowing the bullying to occur time and time again without fighting back. When the teacher is doing roll call, a ray of light shines on kuno’s empty desk right before she walks in with the shaved head. As for Tsuda, she defies her bully and redeems herself in her own way by committing suicide. After her death, we are shown her empty classroom desk with a bundle of flowers on it. If you notice, a huge ray of light is shining down on that desk. After killing Hoshino and putting a stop to the bullying once and for all, Yuichi has a conference with his teacher. At the conclusion, his teacher asks him to tell Kuno that its time to go home and so he slowly walks by her and stops directly under a ray of light. He watches and waits for her to stop playing the piano, all the time being directly in the path of the shinning light. In my opinion, he will ask for her forgiveness when she’s done. My theory is that this ray of light represents redemption. You know….these characters were “in the dark” and now have been shown the light type of deal! Any takers? Or am I overreaching? 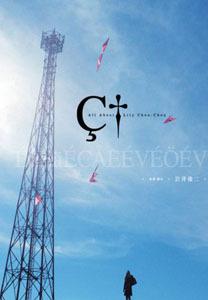 I haven’t seen AALCC in a while, so I can’t be sure on your “ray of light” theme. But the film is utterly depressing to me. Kuno did stand up to it all by showing up with her shaved head, but it still feels like impotence. And Yuichi… he’s trapped into a new bullying cycle.